Korea and The United States established diplomatic relations in 1882, according to the National Committee on North Korea, a nonprofit group. After World War II, in what was supposed to be a temporary measure, the Korean Peninsula was divided into two parts. Soviet-supported Communists controlled the north while US-backed leaders dominated the south. The two sides plunged into war in 1950, each backed by its patron, with China also supporting the north. The fighting ended in 1953 with an armistice, not a peace treaty, and hostile relations have continued. Since the 1980’s, the United States and North Korea have had a history of unsuccessful formal negotiations over North Korea’s possession of nuclear arms. Two groups have launched unusual efforts at conflict resolution between these countries. In the first case, the New York Philharmonic Orchestra learned that many North Koreans have a passion for classical music and American orchestras. 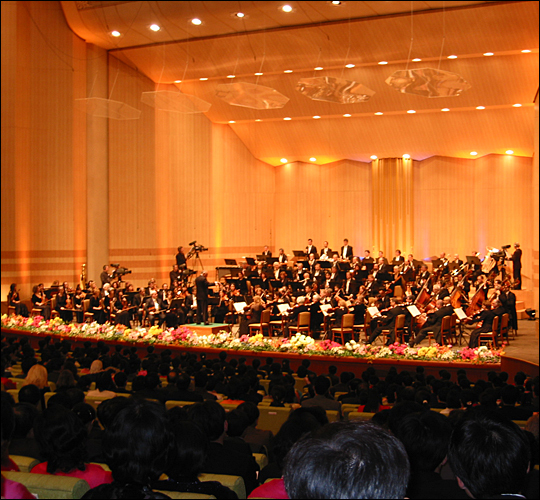 The Philharmonic visited Pyongyang, the North Korean capital, in February 2008 to perform a concert for top North Korean government officials, as Blaine Harden reported for the Washington Post. Harden wrote that the two orchestras were able to bond over their shared familiarity in performing Tchaikovsky and Richard Wagner pieces Although the New York Philharmonic was full of diversity and the North Korean orchestra was not, this did not appear to affect the bonding experience between the two groups of musicians. New York Philharmonic members, who previously knew nothing about North Korean music, felt the experience was eye opening. In fact, the Philharmonic raised the possibility of the North Korean orchestra one day performing in the United States. The final performance that the New York Philharmonic played for the North Koreans was emotional and historic. The North Korean audience rose in a standing ovation and cheers at the end, according to Harden. Unfortunately, unlike the following case study, this method of conflict resolution did not motivate the North Korean leader of that time, Kim Jong-il, to attend the performance. However, in a surprising move, the musical performance by the Americans was reported in leading North Korean newspapers and broadcast on state radio and television from start to finish, according to Harden. An article by The Associated Press, in 2013, reported on basketball diplomacy that began when Dennis Rodman, a Hall of Fame player, and three members of the Harlem Globetrotters visited North Korea, and journalists from Vice Media Productions made a documentary about the trip. The project’s biggest supporter was the young North Korean leader Kim Jong-un, who has loved only one thing about America: basketball. He had been a fan of the Chicago Bulls since his adolescence and an admirer of Dennis Rodman, a Bulls star. Kim Jong-un agreed to cooperate with Vice to bring American basketball to the country for a little while, despite the fact that the players were Americans. The goals of the Vice documentary, according to the producer, Shane Smith, were to “run a basketball camp for children, play pickup games with locals, and compete alongside top athletes of North Korea.” As seen in the Vice documentary, this is exactly what the visit produced. Max Fisher of the Washington Post reported that Dennis Rodman’s agent, Darren Prince, said Rodman knew the visit would be a “once-in-a-lifetime opportunity to have a fun shoot around playing basketball and…have the chance to speak directly to Kim Jong-un” and to go with a peaceful mentality. The trip culminated in a major basketball competition between two teams that each combined members of the Harlem Globetrotters and of the North Korean “dream team,” according to Alan Duke, a CNN journalist. Since each team had players from both countries, there was no U.S.-North Korean tension on the court. The crowd and North Korea’s leader were engrossed in the game. Duke reported that the final score was a very diplomatic tie: 110 to 110.